The holidays and three little boys have a knack for getting in the way of my blog posts sometimes and this week is an example of such. I made this soup over a week ago but am now just finding time to write about it. Ahh…no reason to bemoan a busy schedule – I’d probably complain about being bored if my schedule was less packed. At any rate, we love soups in our house when the weather gets cold. I have a few staples that we rotate through quite often but I am also always trying to develop new recipes. This one came about because I had some extra broccoli and no idea what to do with it. And truthfully, I created this recipe to be “Broccoli Cheddar Soup” only to realize I was low on cheddar. Not to worry though, I had plenty of mozzarella on hand and the sharpness of the cheddar balanced nicely with the creamy mozzarella. 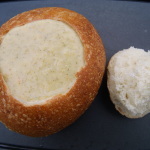 I served this soup in a bread bowl and called it a meal, but it would be just as good piping hot, in a bowl, on its own. 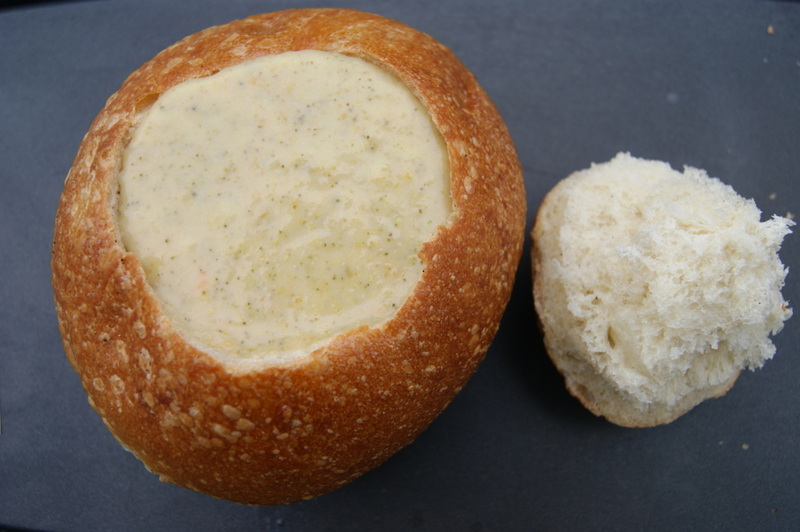 But really – what’s better than a crusty bread bowl filled with creamy, cheesy soup? Melt butter in a large pot over medium heat. When butter is melted add onion, carrot, salt and pepper. Saute until softened, about 5 – 7 minutes. Whisk in flour and cook for 3 – 4 minutes until golden. Stir in chicken stock and broccoli. Reduce heat to medium-low and simmer for 20 – 25 minutes until thickened. Puree soup in batches in a blender or in the pot using an immersion blender until smooth. Whisk in cheese and simmer until cheese is melted, stirring often, about 15 minutes. Taste and adjust seasonings as necessary. Thin with additional stock if the soup is too thick. Garnish with additional cheese and serve in a bread bowl, if desired.